Getting yourself going in the morning can be tough, its even harder when you have to get your little ones going as well. Creating a morning routine or ritual can serve as an anchor to a potentially chaotic morning. Join me at the Sable Collective (3133 N 22 St., 19132) for a grounding workshop on building a meaningful morning practice that prepares you AND your little ones to take on the day. This winter season has been great for Going Inward Wellness, LLC. 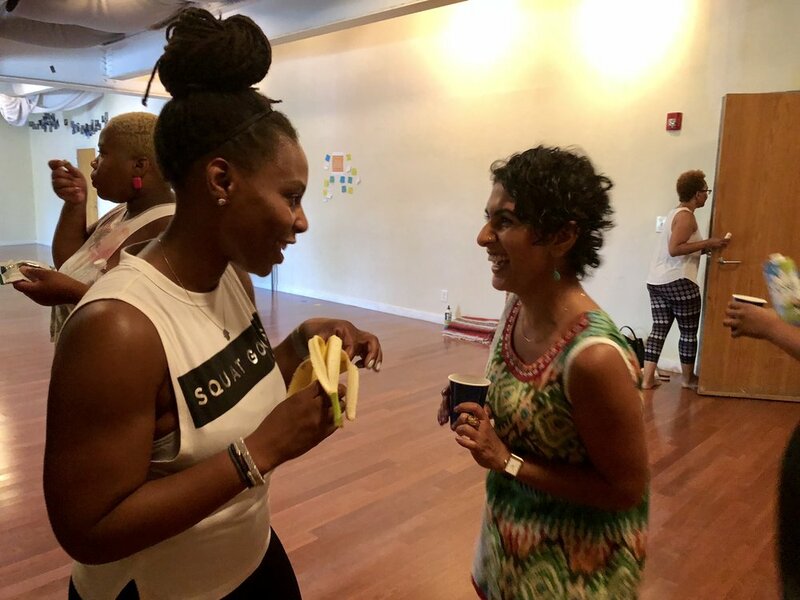 My private practice is growing, and I am getting really clear about the things that Going Inward Wellness is best positioned to offer the community. I have been listening and incubating all winter, I am ready to share what I have learned and get moving on some new projects. The theme of this winter was fear. I have been working to get out of my own way, revisiting lessons I thought I already learned about money, learning to say yes before I can talk myself out of a good thing, and deeply investigating how fear was showing up in my world. It was hard to hold the mirror up to myself at times, it was hard to admit I was the problem. When I discovered that I was the problem, I also discovered that I was the solution; this was pivotal. Instead of beating myself up, I leaned in, and asked more questions. What I initially framed self-pity, guilt and misfortune became learnings. All of these learnings are still unfolding for me as I prepare for the second season of this new year. - When you invite change and elevation you are inviting discomfort into your life. Embrace it and watch what happens. - No one is responsible for your success, you are your own biggest hurdle. - Unconscious habits and ways of being will sabotage your conscious efforts. Check your schemas and automatic assumptions. - Getting intimate with your fears is the best way to deactivate them. As I said, these learnings are still unfolding for me; I will not rush the process. What lessons are unfolding or you? What are you ignoring? Are you aware of the ways in which fear shows up in your life? These are just some of the questions you can investigate. I encourage you to investigate some aspect of your being to ensure your autopilot doesn't land you somewhere you don’t want to be. My autopilot was steering me into the safety of mediocrity. This work is easier said than lived, but I believe in myself and I believe in you. 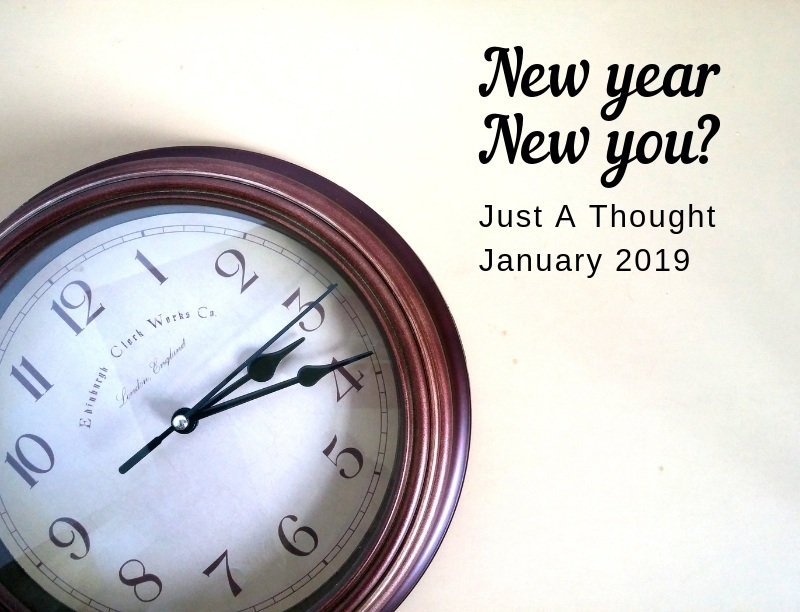 Just a Thought: New Year New You? Are you ready to take on the change you are declaring in this new year? While your calendar might reflect a new year, don't feel compelled to change your life simply because the date has changed. Yes, the Gregorian calendar new year is a great time to take stock of your life, but there are no rules to change. Take inspired action based on well thought out intentions, not a change in date. Commitment does not evolve simply from a good idea, it grows out of intimate awareness. When considering the changes you want to make in your life, can you claim an intimacy of understanding that offers you a bird’s eye view? Are you aware of all the ways this issue shows up in your life currently? Are you aware of how the change you are seeking may impact seemingly unrelated areas of your life? Are you clear on your why? These are just some of the considerations you can make when getting intimate with your stuff. ; that which you hope to change. Sometimes being fed up with your stuff, or sick and tired of your stuff is not enough to propel you to change. If there is no intimacy there is no understanding; if there is no understanding there is no commitment. Whether you are in the process of getting intimate or you are standing in your commitment to change, honor your own timeline. Just consider, the “new year” is celebrated on February 5; August 30; and October 27 if you are Chinese, Muslim or Hindu. Any day can be the start to your new year. Each new day brings the opportunity to start over, recommit, or try it differently. You have the power to assign your own meaning to dates, and time periods. Give yourself permission to get out of the cycle of declaring change for the sake of the new year, and beating yourself up over the results. Commit to change and intentional growth on your own terms, and watch what happens. The first I Came I Released I Rest was so good Adia and I had to do it again. Our bodies store our emotions, especially our more negative emotions. In order to process and release these emotional states it is necessary to engage the body. Join Going Inward Wellness, LLC and dance choreographer Adia Imani, for an afternoon of movement medicine. Together, we will engage our bodies in movement to release on purpose. Participants will enjoy: dance fitness; meditation; deep stretching; and reflection. Start the new year right with other women of color in a safe and loving environment. Whether you are just starting your process, or looking for "that thing" to help you finally let go of that emotional burden, we are ready to meet you where you are at. What to bring: All you will need is a water bottle and a light snack! Mats will be provided. As much as we might like to try, anger is one of the most difficult emotions to wrangle. That’s why I created a safe grow space for self identified women of color to explore their relationship with anger. Whether or not you think you have an “anger issue,” we can all improve our understanding of anger. This is a free event, childcare provided. Interested in attending? Resolving both trauma and stress in the body requires you to engage your body. With that understanding in mind, Adia Imani and I have curated a safe space for women of color to release on purpose through engaging your bodies in dance and movement. This half day event will allow for intentional reflection and meditation in addition to movement. Participants interested in attending should RSVP at via our community venue, Studio 34. So good we had to do it a second time. Location TBA. Come Catch Your Breath With Me! I am honored to be one of four mindfulness meditation leaders at Philadelphia's Institute of Contemporary Art (ICA). 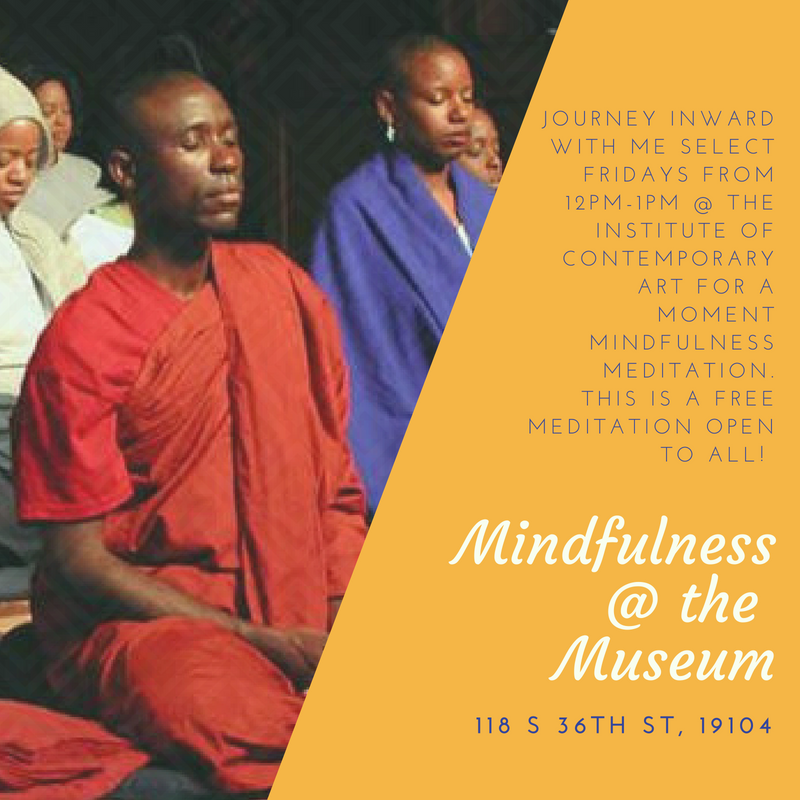 Every Friday at noon, the ICA offers Mindfulness at the Museum, an hour long FREE mindfulness sitting. Whether you have a thriving meditation practice, or you simply want to try meditation for the first time, all are welcome. I invite you to come catch your breath with me. No special clothes are equipment necessary, simply bring your breath. I hope to see you at the ICA! I am super excited to bring this grow space to mothers of color in Philadelphia. Over the last year, I've been having conversations with different Black women about success and self care. I was taken aback by the number of "successful" women who were depleted, out of balance and out of personal alignment. These conversation gave me pause, I had to question my own ideas of success and where I had sacrificed self care in the name of success. I also started to think about what it takes to successfully balance: motherhood, career, self care and achieve "success." In the end, I found myself with more questions than answers, thus the curation this event. Check Out My Article on Shoppe Black! Check out my article on 6 ways to beat the holiday blues.